The national discussion over Confederate war memorials is centered on the implicit question: who owns history? Often that is a question that is difficult to answer because in fact everyone owns history. Interpreted in a material way, however, it’s possible to be more literal: in terms of sources, for example, it is quite apparent that the Peabody Essex Museum owns Salem’s history. The PEM’s Phillips Library, the third largest museum library in the United States, is the largest repository of historical records of Salem and Essex County by far: its holdings encompass the papers and records of innumerable Salem families and organizations, the definitive collection of Hawthorniana, all sorts of records relating to Salem’s China Trade, including logbooks, customs records, merchant account books, hand-colored plates of ships, maps, and the Frederick Townsend Ward collection, one of the world’s largest collections of Western-language materials on Imperial China. The Library holds a million historic photographs, including rare nineteenth-century views of Asia, the archives of Edwin Hale Lincoln, Frank Cousins and Samuel Chamberlain, and the complete North American Indian portfolio of Edward S. Curtis. The Edward Sylvester Morse collection of Japanese language books is just one small part of a 400,000-volume collection which began in 1799. The physical size of the entire collection is best expressed by numbers: 5000 linear feet of manuscripts, over 1000 linear feet of archives, 3,000 linear feet of newspapers, 135 linear feet of ephemera and nearly 5000 reels of microforms. The bulk of this collection was compiled when the Phillips Library was part of the Essex Institute (established in 1848), which merged with the Peabody Museum to form the new Peabody Essex Museum in 1992. As part of a new, ever-expanding museum which privileges the global and the sensational over the local and the historical, the Phillips Library’s mission has clearly changed: to what I do not know. But more importantly, it has become increasingly restrictive and inaccessible, and absent: it was closed for renovations in 2011 and its collections were moved to a facility in Peabody and now it is moving on to another (temporary?) facility even further away, in Rowley. According to one succinct statement regarding this move, and supposedly to facilitate it, all access to collections will be suspended from September 1, 2017 through March 31, 2018. Gentlemen in the Phillips c. 1885, and ladies outside Plummer Hall on Essex Street, which housed the Library for over a century; Logbook from the ship Horace, first decade of the 19th century. All images in this post (except those from the Essex Institute Historical Collections Volume 113, no. 3 below) are from the Library’s social media accounts: Twitter and Instagram. The Library’s wonderful blog, Conversant, has been shut down, but you can still see some of the images it featured on Pinterest. The lingering detachment of the Phillips Library has been nothing short of tragic for Salem, as it long served, in purpose and in effect, as the city’s historical society. While other towns in Essex County developed historical societies and museums over the course of the nineteenth and early twentieth centuries, Salem did not, because it already had one: a vast repository of private (and public) records right in its midst. You can see–and read—Salem citizens engaging with the Essex Institute and the Phillips Library (with their history) in the pages of the long-running (and thankfully digitized) Essex Institute Historical Collections, which is full of recollections and memorials as well as historical analyses of materials in the Library’s collection. Given Salem’s dynamic past, the lack of an accessible and engaging repository of its heritage has resulted in historical interpretations that are entrepreneurial at best, and crassly commercial for the most part: is it any wonder that we have a statue to a television character in our central public square? One of my very favorite volumes of the EIHC from July 1977: focused on a coincidental exhibition at the Essex Institute on the life and times of the Salem’s famous diarist, the Reverend William Bentley. It’s full of insights and images, including: a plan of South Salem Bridge and Lafayette Street, c. 1806, a certificate for the Salem Iron Factory, c. 1800, and a print and portrait of Salem printer Thomas C. Cushing, c. 1806 and 1816. Along with social media, these volumes might be our only avenue of access into the Phillips Library for a while….. There are many curious, engaged and energetic people in Salem who clearly crave a closer, more introspective connection to the city’s complex past but I wonder how this can be achieved when we have so little access to our material heritage? That’s the big question, but I have so many more. Why haven’t more of the Library’s collections been digitized? That seemed to be the intent several years ago, but I only see a few digitized collections on the Museum’s website (volumes of The American Neptune, images of the Great Salem Fire, ocean liner ephemera, vintage valentines, the Winthrop family papers): this is a scant amount of material in relation to the Library’s entire collection and in comparison with the efforts of other comparable libraries. What about public records? The Phillips holds the major legal records of the Salem Witch Trials, the Essex County Court Archives, which were deposited at the Essex Institute by the Massachusetts Supreme Judicial Court in 1980, as well as the records of the Quarterly Courts of Essex County. These records have been transcribed, printed, and digitized (at the University of Virginia’s Salem Witch Trials Documentary Archive and Transcription Project) but don’t we still have a legal right to access the actual documents? I would imagine that the representatives of all those Salem families and institutions (the Appletons, the Crowninshields, the Derbys, the Peabodys, the Active Fire Club, the Salem Society for the Moral and Religious Instruction of the Poor, the Salem Female Charitable Society, the Salem Charitable Mechanic Association, the Salem Marine Society……I could go on and on and on…..) assumed that when they placed their records in the safe-keeping and under the stewardship of the Phillips Library that they would form part of a public archive for posterity: otherwise what is the point? And finally, I am thinking–and wondering–about my Americanist colleagues and how they’re going to conduct their research come tomorrow, when I will have more tools and materials at my disposal as an English historian here in Salem than they will. More random treasures from the Phillips Library: a 1687 deed conveying Rumney Marsh to Colonel and Mrs. Paige; a reward of merit bestowed upon Elizabeth S. McKinstry; a plate from Robert Manwaring’s Cabinet and Chair-Maker’s Real Friend and Companions (1765); just two broadsides; George Peabody’s letterbooks; a Frank Cousins photograph of the entrance to the Andrew Safford House. These tweets and posts from @pemlibrary are lifelines! This entry was posted on Thursday, August 31st, 2017 at 12:49 pm	and tagged with Commemoration, Digital History, Historical Research, Libraries, Local Events, Memory, Peabody Essex Museum, Phillips Library, public history and posted in History, Salem. You can follow any responses to this entry through the RSS 2.0 feed. 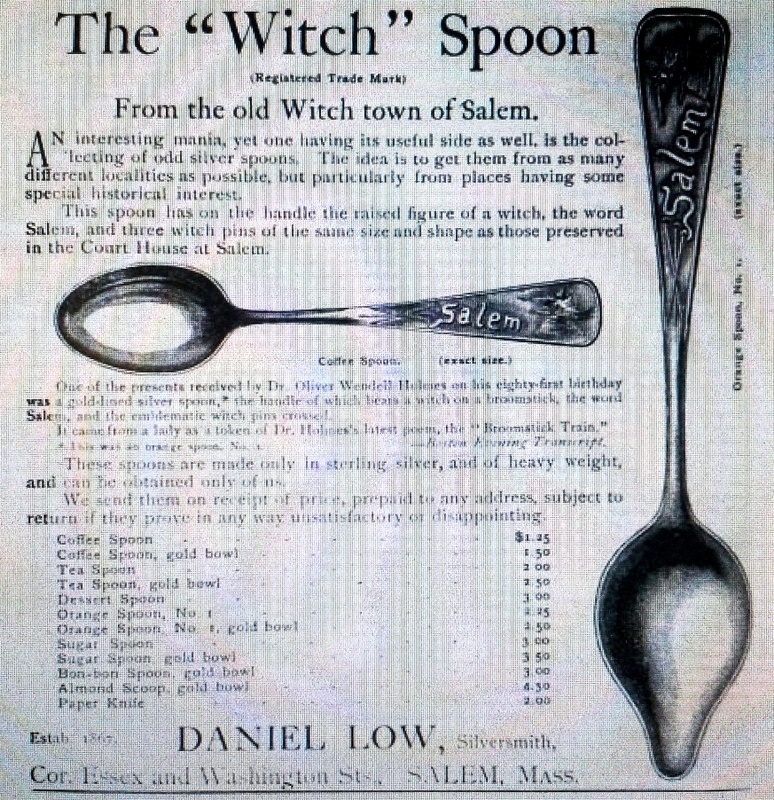 I am in the very early stages of research for a possible book that would concern The Daniel Low Company, Almy Bigelow & Washburn, Frank Cousin’s Beehive, Woolworth, Sarah Symonds Colonial Studio, and other local merchants known to have offered Salem Witch Souvenirs during the late 1800’s through the demise of the Daniel Low Company in the early 1990s. I own several physical souvenirs, as well as a few vintage Essex Institute Visitor Guides, and Daniel Low Catalogs. Sadly, the information in them is far too sparse to fill more that a brief pamphlet. Your article saddens me, as it would seem to indicate any entreaties made to the PEM would fall on deaf ears. Any suggestions you may be able to offer would be very appreciated. Wow, that sounds interesting! I’m really not sure what’s going on with the Phillips, besides the fact that they are closing their doors for several months beginning tomorrow. I’m just asking questions and trying to articulate how important I think they are! So don’t be discouraged by me. They would be your major repository, so I think you have to make your own entreaties. You are correct on many counts. It is high time Salem form a Historical Society that is more accessible to average citizens. It would certainly include a great deal that is far too mundane for the PEM, such as Salem’s Textile Industry, Cinema History, Theatres, etc. Sadly we are perhaps 30 to 50 years too late to interview the actual principals. Scuttlebutt has it when Sarah Symonds passed, her records, her molds, her works in progress were carted to the curb ! The Philips Library was the first casualty, although not the most prominent. The squalid vandalism-by-neglect of the Pierce-Nichols is the perfect metaphor for the vanity and low-brow leadership that brought the Philips to this pass. Well, I would disagree here as well. The PEM has simply set different goals for itself than the Essex Institute had. If anything, I would characterize PEM as more HIGH BROW than low-brow, and certainly more cosmopolitan. I enjoy the PEM and its ever-changing exhibitions very much. I even found SHOES fascinating ! And the transplanted Chinese House is a genuine treasure. But yes, it is very sad the short shrift given by the PEM to local history these days. PS: Anyone remember when the PEM held a series of Ghost Stories told by talented local actors inside their historical homes ? EERIE EVENTS was easily the finest seasonal event held in the city every year it was maintained. My family misses it a great deal. Speaking of Shoes, wasn’t there a 17th century Shoe discovered in the (Horrid) mud at Dead Horse Beach by the Willows a few years back ? BTW, the mud there has an especially unpleasant feel to it – IMHO. The mystery as to WHY was solved (at least to my satisfaction) when I discoverd the area was known as RESTAURANT ROW up until the mid-1950’s. There were at least three establishments that specialized in Fried Shore Dinners right by that beach. Decades of spent Grease were quite likely disposed of directly into the water. You’ve perfectly encapsulated my frustration with this situation. The Phillips library is an amazing repository of historical materials, many of which I will be using in my dissertation work and I’ve spent the summer (right up until yesterday) frantically compiling as much material as possible to get me through this period that they will be totally inaccessible in the hopes that they will actually reopen on schedule. It must also be said that the library’s policy on images is prohibitive. Most archives or libraries that I’ve visited either allow for free photos or a minimal charge (10-15¢) for copies whereas the Phillips charges a dollar per image. Clearly the library isn’t keeping itself afloat with this money, so I’m not sure what the thinking was in establishing that policy. Oh well, it’s nice to know that I’m not alone in my displeasure anyway. Thanks for commenting, Sean–I really wanted to hear from a doctoral student who is absolutely dependent on this important repository! Had a recent discussion with the library regarding both accessibility and the pricing of images. Long story short, I got multiple conflicting answers on why pricing is as it is, but the thing that was made clear was that the purpose was to “deter” researchers from taking images so that they could “have control” of all information leaving the library. It doesn’t seem that the library is concerned with scholarship or access. In the end it was confirmed that they know their materials are one of a kind, and necessary for research, but they intend to keep them under lock and key and behind a pay wall. Thank you, Broch. This is what I am hearing from many, many researchers. Thank you for that frank discussion of the sad state of the Essex Institute’s accessibility in recent years. I recall that you alluded to their condition in your remarks at the June 10 conference at SSU. I was a member there in the early 80s (my “first” historical phase) and recall attending many excellent programs – with wine ‘n cheese I believe. I would occasionally drop into Phillips and peruse those old dusty volumes. I loved the building. So true. I am familiar with many local historical societies on the North Shore that have survived with different iterations through the years. Most were started in the early 20th century, if not before, and are unlikely to be created in the present day. If the good folks of Salem undertake such a project, I wish them Godspeed. Let us all pray that it is never discovered that Roger Conant owned a SLAVE. Or Salem will lose a statue to MOB VIOLENCE as well. Your comment is divisive. No one is asking for statues to be removed just because the person owned slaves. The statues in question are of people who were traitors who fought in the Civil War for the right to own humans as property. Those people understandably should not be memorialized. Don’t pretend you’ve not heard the voices to remove the statues of Columbus, Jefferson, and Washington. Statues of Columbus and Lincoln have already been vandalized. The only ones mentioning removing Jefferson and Washington statues are Trump and the nutters on Fox News. Washington and Jefferson were nation builders, not nation dividers. Your original comment to Donna’s article shouldn’t even be here. It has nothing to do with the point she was making. I think we can have a respectful discussion about this issue–but this issue is not the issue of the post. Dear Pearl, your last comment speaks for itself. Lol, important AND BALANCED* — not unbalanced. I should never type of comment on my phone as Auto incorrect will defeat me at every turn and subvert my meaning. Thanks–it started out quite a bit longer with some comments re “generic Art Museum” (with 2 exhibitions focused on POSTERS now) but I thought it would be stronger if I just stuck to the Phillips. Great posting that highlights a long standing problem. Perhaps if Salem had better leaders they would advocate for the people of Salem with PEM instead of always agreeing to their plans for expansion, removal of roads etc. You’d think if they had any sense of history, which I doubt, they could have at least argued for PEM to sponsor a Salem Historical accessible archive as a good neighbor.They don’t seem to comprehend negotiations. That is the best idea, Jerome. In the abandoned Court Buildings!!!! I was going to suggest it myself but the post was getting too long–Part II sometime. I do think we need some leadership here. The brick Superior Court building on Federal Street is an architectural treasure, that I pray will not ultimately descend into the lowest form of use: CONDOS. Ironically, for many decades it WAS a stop on the Essex Institute’s published Visitor’s Guide to Salem. Why ? Because it held, on display, a small glass vial containing the actual WITCH PINS. Although those with a dramatic flair long insisted they were used to prick the “witches” during interrogations, others said they were merely used to hold documents together. Although I long held to the latter belief, as of late I began to come to the former train of thought: instruments of minor torture. The reason for my change of heart is there were a LOT of documents; so many that three tiny pins could have never hoped to organize. And as the “Paper Clips” of their day, they would have been unlikely to have been treasured and maintained with such dignity. Now some may say that the Witch Pins are no more genuine than are pieces of The True Cross. Perhaps. But provenance across a mere two centuries is far more likely than across two Millennia. I, for one, am a believer. And I have seen the Witch Pins myself, about a decade ago, in the exact place they had been for over a century. Sadly, with all the recent renovations to our Court Buildings, I have no idea where they may be now. Excellent article, Donna. When the Essex Institute merged with the Peabody Museum, I had the sense that the Essex Institute would play second fiddle to the Peabody Museum. I was right. The PEM sees itself as a world class museum, so local history has suffered as a result. You are correct that the PEM is moving large collections to Rowley for storage. That is around the corner from me. The building is a large warehouse built in the 1990s as a storage building for a toy company. It’s a large building and will store quite a lot. I don’t know if PEM bought or leased the building. It’s an important topic and as usual, you’ve given it thoughtful treatment. Perhaps the leadership needed is from the PEM’s board of trustees, who permitted the Essex Institute collections to disappear and failed to protect public access to local historic resources. You’ve taken the first step, pointing out the great loss the public doesn’t even know it has suffered. You draw a pungent analogy with British history available online. There is a public trust implied in the charitable status the museum enjoys. The fact that PEM can make money from poster exhibits but not from its magnificent document collection doesn’t justify closing them down for an extended period. I wonder whether the charitable division of the Attorney General’s office would be the place to send an inquiry regarding trusteeship of public documents? Certainly the roster of trustees should be asked to comment on their appalling dereliction of duty. I think that’s true, Nina, but we need someone with more clout than me to do it! I’m not sure how many of the people here are Seniors, but as one myself, I am familiar with one thing: Prior to the PEM’s reincarnation both it and the Essex Institute were absolute SNORES. Stodgy, Dark, and Dusty, one visit to either address was plenty for one lifetime. Exhibits never seemed to change, and there was nothing to capture the imagination of the general public. After decades of this I can only imagine that the coffers were running quite dry indeed. Yes, it’s a shame the Essex Institute has been seemingly neglected, but the PEM itself has surged as a vibrant venue for an ever-changing menu of world class exhibitions. Now I am not specifically familiar with the warehouse in Rowley, but I would expect at the very least it is a modern, spacious, secure, and climate controlled structure – well suited to the storage of artifacts. The cramped conditions at the Phillips Library may eventually be replaced by a state-of-the-art research area in Rowley ! Complete with scanners, computers, security, and equipment that the Essex Institute could neither comfortably accommodate, nor afford. Now I will admit this is largely the speculation of an optimist, and I will also admit that the PEM has not communicated its plans for the Library at all clearly. Still, I an steadfast in the belief that treating the PEM as an adversary is simply counterproductive. Polite and supportive communication is far more likely to yield positive results. Before the Phillips Library closed for its recent round of renovations in 2011, it had already gone through a previous round and was quite nicely-equipped: your characterization of cramped and crowded Essex Institute might apply to 1992 but not to the 21st century. I think many people who have commented here and elsewhere on this piece would be sad to see Salem’s material history lodged in Rowley, however “state-of-the-art” the facility. Well, Rowley is in Essex County. Does anyone happen to know what plans the PEM has for the Essex Institute buildings ? Something I’ve not seen discussed here, as of yet, is the sad fact that there are “Researchers” who would be better described as VANDALS and THIEVES. Take the infamous case of Edward Smiley ( http://www.npr.org/templates/story/story.php?storyId=5508778 ) , who made millions on maps he stole from libraries. Not every perp is on his level, of course. There are those who peruse archives carelessly, soiling books, dog-earing the pages, breaking their spines. A great many books are stolen for resale. Not always rare volumes, either. Ask any Librarian about attrition. Of course a Volume on Auto Repair is a monetary loss to any library, but the loss of any document from a historical archive is a loss to history. I will admit to total ignorance as to any security measures the Essex Institute ever had or has, but if they are not complete, it would be better if the documents were kept inaccessible. Of course, in this modern day, scanning everything of note and making it available online, even through a Pay-Wall, is the obvious solution. But where are the funds to make it so ? You make some very good points. Coincidentally, our newspaper in Rowley reported that someone went to check out a movie DVD from our library and the DVD was missing from its case. The librarian decided to do a check of other DVDs and found that 70 were missing. She checked with nearby towns (Topsfield, Georgetown, Ipswich, etc.) and they had similar problems. This is sad that something free to the public is stolen from some individuals and thus denied to others. If small towns have losses like this, I can imagine how much worse it is in Salem, Peabody, Beverly, etc. I may be showing my age because I question why libraries buy DVDs rather than more books, but that is a discussion for another day. I agree having all documents available is probably best from scanning, but as you stated, where are the funds? Thank you so much for your response, John. Frankly I did not know who to approach in regard to the closure, relocation and future of the Phillips. As you can see from the comments here and elsewhere, people are very passionate about the library, and this passion turns into anxiety when we are left to wonder what is going on: I think a detailed press release from the Museum would go a long way towards easing this anxiety. I congratulate you on your appointment, and hope you’ll be working in Salem in the not-too-distant future! Dan Monroe et Al simply do not care about objects or history. It’s not just the library that suffers. The collection of the museum is inaccessible, not digitized, not prioritized. It’s organization is what you’d expect if a small, poor local museum, not a place that has a huge endowment and 30m annual budget. . Management only cares about sensational experience in the gallery and big buildings. They have extraordinary resources that they waste. Time for new leadership.